In June, I wrote a blog post about the Ephemerisle Festival, a gathering on the Sacramento River Delta that imagines what a floating city might look like. The festival hopes to educate people about “seasteading,” which refers to long-term communities at sea, away from the interference of national governments, where residents can practice self-reliance and self-governance. At the time, it seemed as though a permanent community at sea might be decades away. 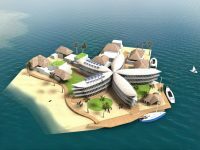 The Seasteading Institute, which has been studying the feasibility of the concept for years, initially proposed a seastead in international waters. But the challenges of building in the deep ocean proved too high, and instead it set its sights on building closer to land and partnering with a host nation willing to support the project. Now, a new report reveals that the organization will work with French Polynesia to build an offshore floating settlement, with “ground”-breaking set to begin in 2017. French Polynesia is a group of over 100 islands in the South Pacific that operates as a mostly autonomous territory of France. 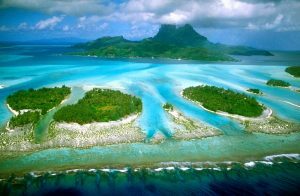 The islands are nearly 3,000 miles south of Hawaii and include popular tourist spots like Tahiti and Bora Bora. Aside from the novelty of the project, the government has another reason to be interested in seasteading: rising sea levels could make off-shore habitats a necessity for island chains like this one. According to Wikipedia, “French Polynesia as we know it today was one of the last places on Earth to be settled by humans.” It’s only fitting that it may become the first place on Earth to host a new form of human habitat. The seastead won’t be directly governed by French Polynesia, though some regulation is likely, meaning this won’t be the libertarian paradise some seasteading advocates dreamed of. Ultimately, the project’s developers envision a special economic zone to ease questions around trade and citizenship. The proposal calls for a platform with room for 30 residents, at a cost of $30 million to build. (This is far less than the $225 million it would have cost to build in international waters.) Additional platforms could be added to the community (or removed) based on the success of the first one. If the community seems too small or isolated for your liking, don’t worry: residents will be free to shop and socialize on the islands, which they can access by speedboat. An undersea cable runs from the region to Hawaii, allowing for high-speed Internet access and connectivity to land-lubbers. The organization is just waiting for the French Polynesian government and president to formalize the agreement. If all goes well, they hope the community could be ready for inhabitants by 2020. Randolph Hencken, the executive director of the Seasteading Institute, tells Business Insider that the community isn’t for “hermits”. Despite its isolated location – or more to the point, because of it – residents will have to rely on each other to govern themselves and tackle any challenges that arise. There’s no mention yet whether the community will incorporate greenhouses, solar panels, or other technologies for growing food and living sustainability. But if this project gets off the ground – literally – then hopefully future seasteads will be able to experiment with a wider variety of ways to live sustainably at sea. “Seasteading is for people who want to engage in the marketplace of ideas, the marketplace of commerce, and the marketplace of government,” Hencken says. We’ll find out soon what that vision looks like. What do you think of this project? Would you consider living on a seastead? Post your thoughts or questions in the comments section below! Main photo by the Seasteading Institute. Photo of Bora Bora by MakeMake. I loved learning more about different communities around the world. The contact information was invaluable. I signed up fro a couple newsletters from the various communities presented. I am seeking my tribe and would like to learn more about different communities around the world.